These plain white ice cream cups are great to have on hand and easy to dress up for any party. Erika shows you how to dress them up with a cute bow and some beautiful herringbone ribbon. Of course, you can use any ribbon that coordinates with your party theme. 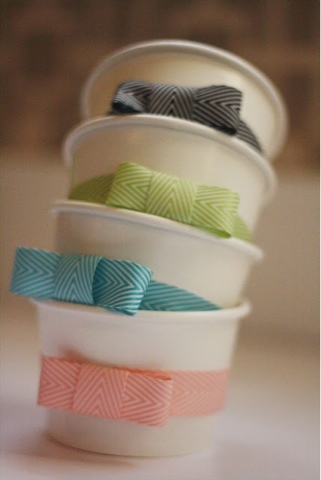 You can check out these dressed up party cups over at Oops, I Craft My Pants. Lori, those are just too cute! !